The long-dormant Bellevue Center mall’s days may be numbered. Developer Crosland Southeast presented its preliminary plans for the mall site, which includes demolition of the existing structure, at a community meeting Thursday at Cross Point Community Church. “Our plan for that project is to redevelop it into a mix of uses, including retail, including hotels, including residential multi-family,” said Tim Sittema, managing partner with Crosland Southeast. Retail will drive a large part of the $100 million plan for the mall property. Developers told Channel 4 they are planning 500,000 square feet of retail space. Crosland Southeast said it already has commitments, but can’t reveal which stores just yet. The site plan also includes a 330-unit apartment development, 110-room hotel and professional and medical offices. 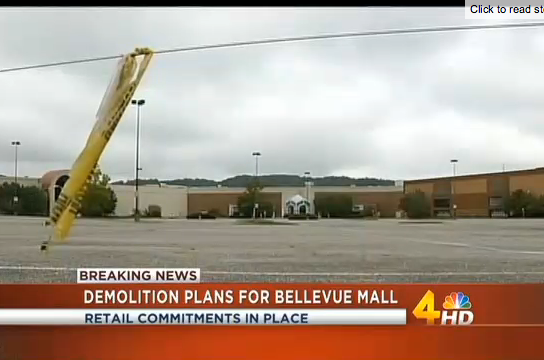 Many have asked what’s next for the Bellevue Center since it closed in 2008. Several ideas have been floated, but so far, nothing has caught on. To many who live in Bellevue, the building has become an eyesore. “It’s just very sad to look at,” said Kathy Langan, Bellevue resident. Charlotte-based Crosland Southeast has a significant history of redeveloping under-used or dormant retail spaces in several southern states. Locally, they’re responsible for Providence Marketplace in Mt. Juliet. Those who attended Thursday’s meeting seemed pleased with the plan. Developers hope to break ground next year, with completion sometime in 2017 or 2018.